As a steadfast “Well, if ‘Friends’ is on, I guess I’ll watch it” consumer of the show, I had no hesitation in setting a 6:30 a.m. alarm this Monday so I could arrive at ‘Central Perk’ in New York’s Soho neighborhood well in advance of its 8 a.m. opening. This is my diary of that trip. On this date 20 years ago, Friends premiered on NBC. As things often go on the Internet, such an anniversary warrants intelligent, thought-provoking takes on how said thing holds up and, ultimately, what it all means. The Friends series finale was 10 years ago — which is perhaps an even more startling realization than the fact that it began two decades ago, because it’s never truly gone away. 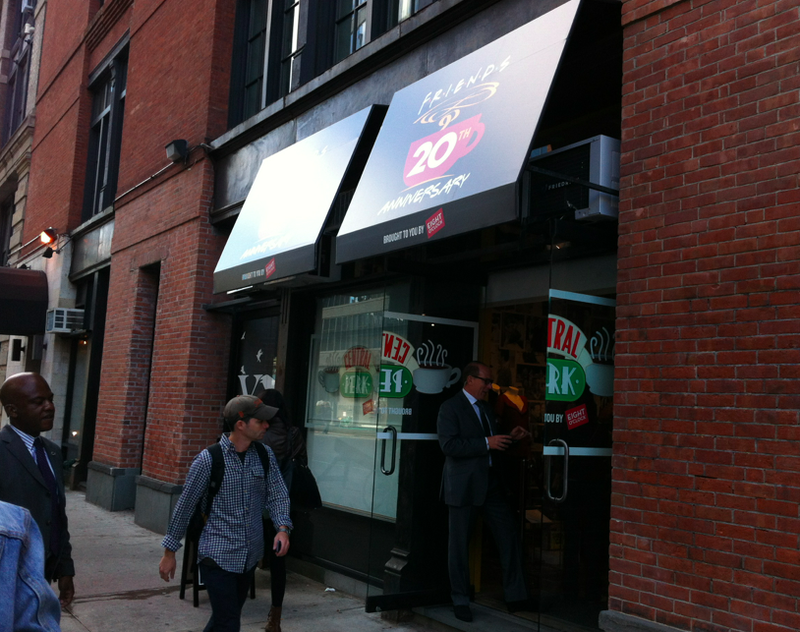 As Slate’s Willa Paskin notes, “Between TBS and Nick at Nite, it is currently rerun eight times a day.” The degree to which it’s still in the public consciousness would explain why something as silly as a pop-up store dedicated to Friends would be packed in 2014. 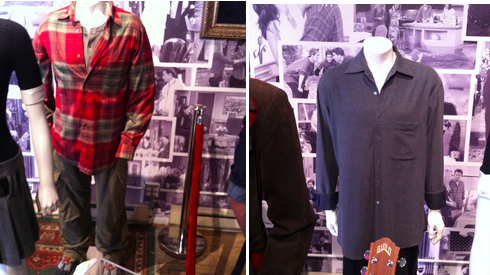 Why a pop-up dedicated to the show’s famed coffee shop, Central Perk, would have people lined around the block just to take some pictures and get a coffee. And why, as a steadfast “Well, if Friends is on, I guess I’ll watch it” consumer of the show, I had no hesitation in setting a 6:30 a.m. alarm on Monday so I could arrive at “Central Perk” in New York’s Soho neighborhood well in advance of its 8 a.m. opening. This is my diary of that trip. 9:08 a.m. Arrive and be greeted by a line that unfortunately has an elbow. 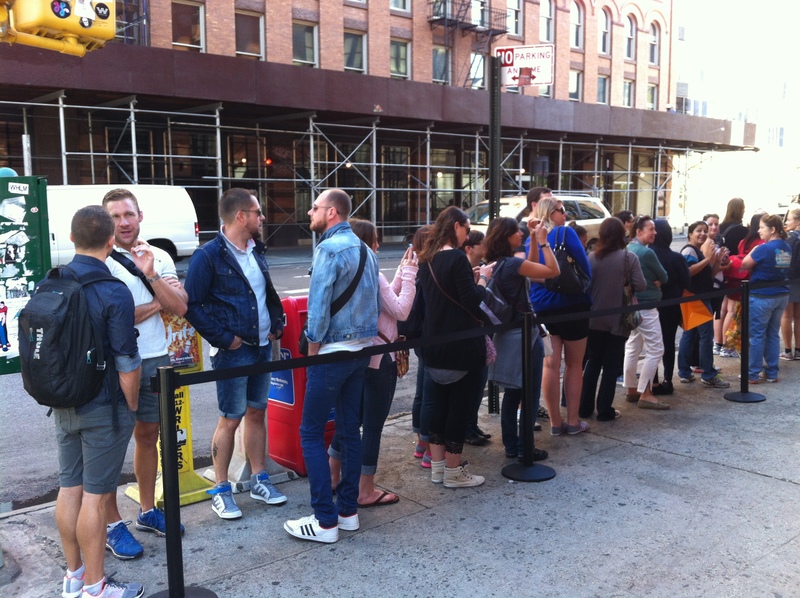 9:10 a.m. Make my way to the back of the line, with only 72 people standing between me and Central Perk. 9:15 a.m. Advance to the point where the first greeter is standing; his self-assigned job is to flirt with anyone he sees, seemingly with the intention of lowering the overall libido of downtown Manhattan. 9:20 a.m. Finally make it to the corner of the block, so far having begrudgingly taken two pictures for people who want to pose under the Central Perk sign. Related: One of their phones has four selfies of my face. 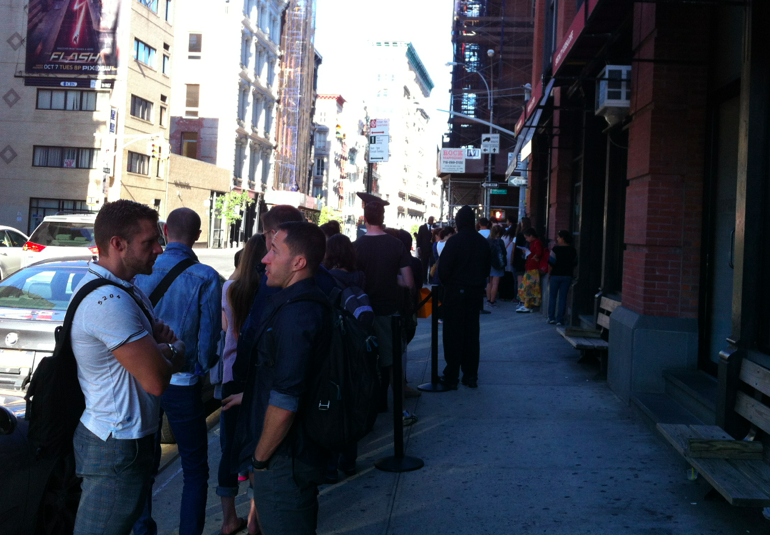 9:25 a.m. One of the security guards tells me the waiting time over the weekend was approximately two hours. Also, he is sipping his second Central Perk coffee. Also, he says he likes it. Also, I’m pretty sure he’s contractually obligated to say that. 9:29 a.m. Someone silent-farts in line. I know who did it. But I can tell the big group behind me thinks it’s me. 9:33 a.m. Finally make it to the front of the line. 9:35 a.m. The Friends theme song starts playing, almost on cue. I hope it’s not on loop, because the employees here might actually go insane. 9:36 a.m. Crisis averted, because “Survivor” by Destiny’s Child is on the playlist. 9:38 a.m. 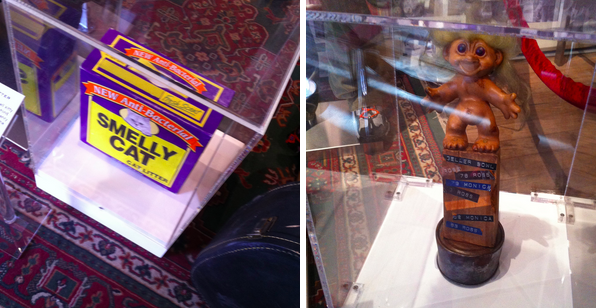 Walking through the first part of the installation, you’re hit with a barrage of Friends memorabilia. 9:39 a.m. And then photos of your friends from Friends. 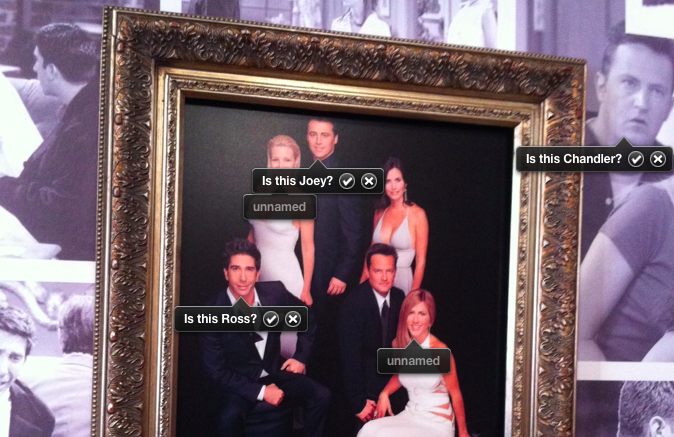 Which iPhoto magically tags for you. 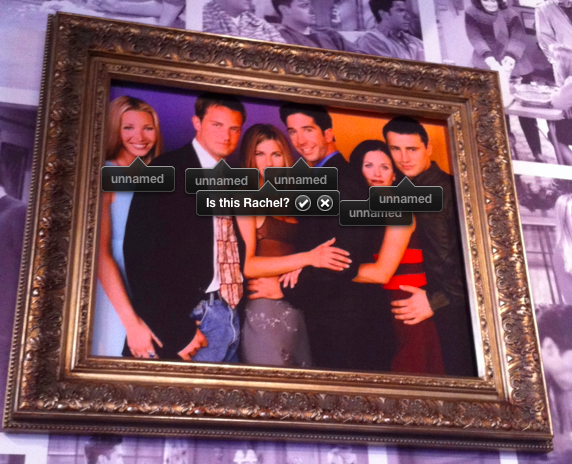 No, of course that’s not Phoebe. Try again. 9:40 a.m. And then you take photos with your friends from Friends. 9:41 a.m. After the selfies, Station 2 of Central Perk: the coffee. While this is happening, “Whatta Man” by Salt-N-Pepa comes on, because it’s a time warp and I’m all in — seriously. All possible cynicism is gone. What will they play next, “No Diggity”? 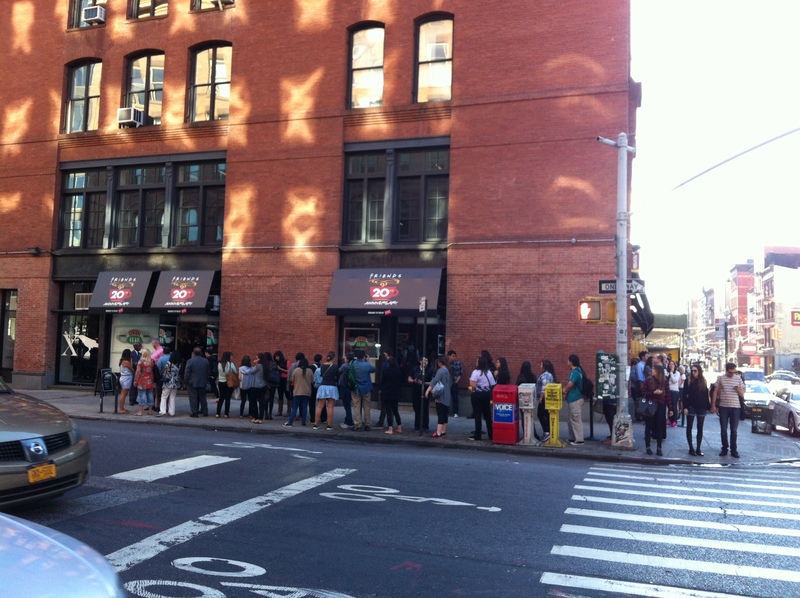 The coffee is free, further justifying the 30-minute wait. Also, it’s pretty good. 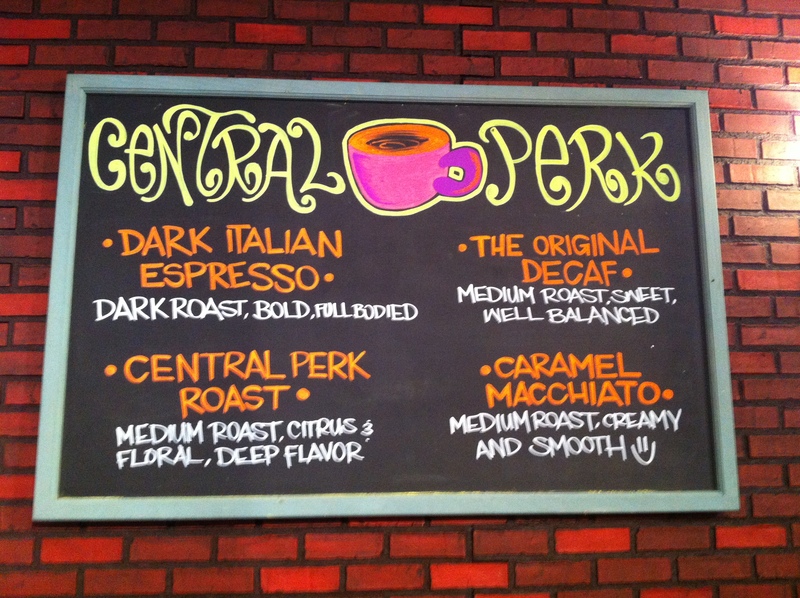 9:46 a.m. “No Diggity” by Blackstreet comes on, officially making this morning visit to Central Perk worth it. Also, the idea of Gunther singing “getting paid is her forte / each and every day / true player way” is enough for me to TEMPORARILY IGNORE THE FACT THAT MY DRINK WAS NOT MADE BY GUNTHER. 9:47 a.m. The greeter by the door is doing a mini-Shmoney dance to himself. It is appreciated. 9:49 a.m. 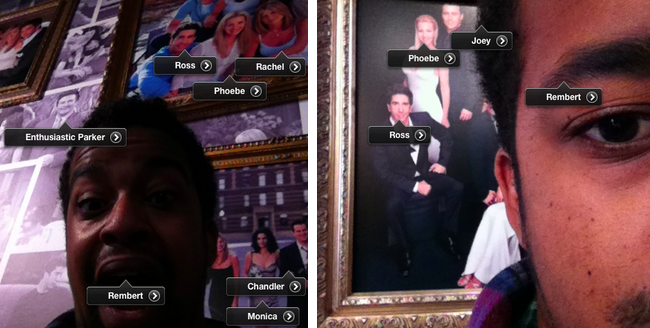 I make my way to Station 3, which is the line to get your picture taken while sitting on the Central Perk couch. It is the primary reason people are here. The line is about 20 people long, so I chat with the guy manning Station 4 (the gift shop) while I wait. Me: Do y’all have any hats? Gift Shop Guy: Nope, sold out. You had to get here at like 7:15 on the weekend. Me: Yeah, I’m not about that life. Gift Shop Guy: I feel you. And this isn’t even real life. The depth of that response paralyzes me. I can’t even respond. I just stay in line. 9:51 a.m. As I approach the couch, its guardian tells me to put my coffee down. Because it’s the real couch from the show. 9:52 a.m. As I sit down, “Don’t Speak” by No Doubt comes on. 9:54 a.m. Rising off the couch while singing “Don’t Speak,” I can’t help but think that I’ll probably swing through again tomorrow morning. 9:55 a.m. Arriving at the final station, the gift shop, I am bummed to learn that in addition to hats, they are essentially out of everything. Which is one of two complaints, the other being the time-warp-ruining refusal to accept cash. 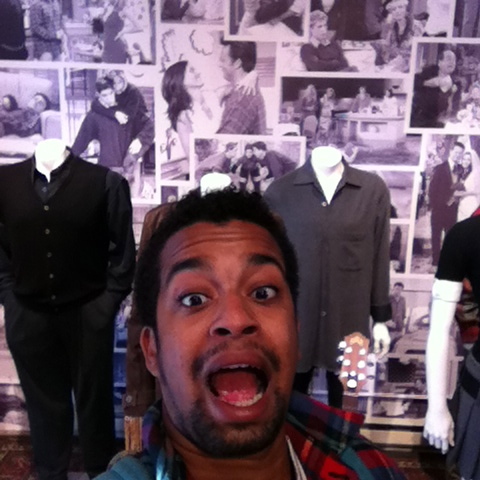 9:57 a.m. As I’m buying T-shirts, “A Thousand Miles” by Vanessa Carlton comes on. I’ve never heard a controller of tunes go five-for-five before, and I can’t keep my adoration quiet. So, once again, I address Gift Shop Guy, expecting another fantastic encounter. Me: Is this you? Are you DJing? Just killing it. Gift Shop Guy: [Shrugs shoulders.] You know. That wasn’t really an answer, and I think he was taking credit for it, and I’m pretty sure he wasn’t actually making the decisions, but that was exactly what I wanted out of that final Central Perk chat. 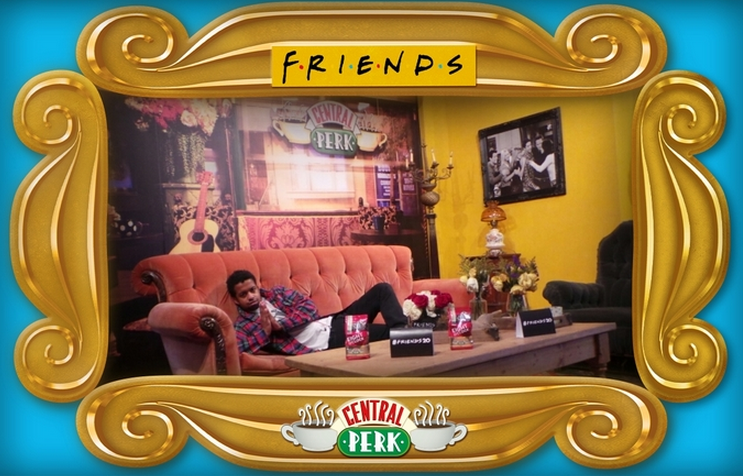 10:01 a.m. BYE, CENTRAL PERK, FIVE OUT OF FIVE STARS, SEE YOU TOMORROW. Yeah. 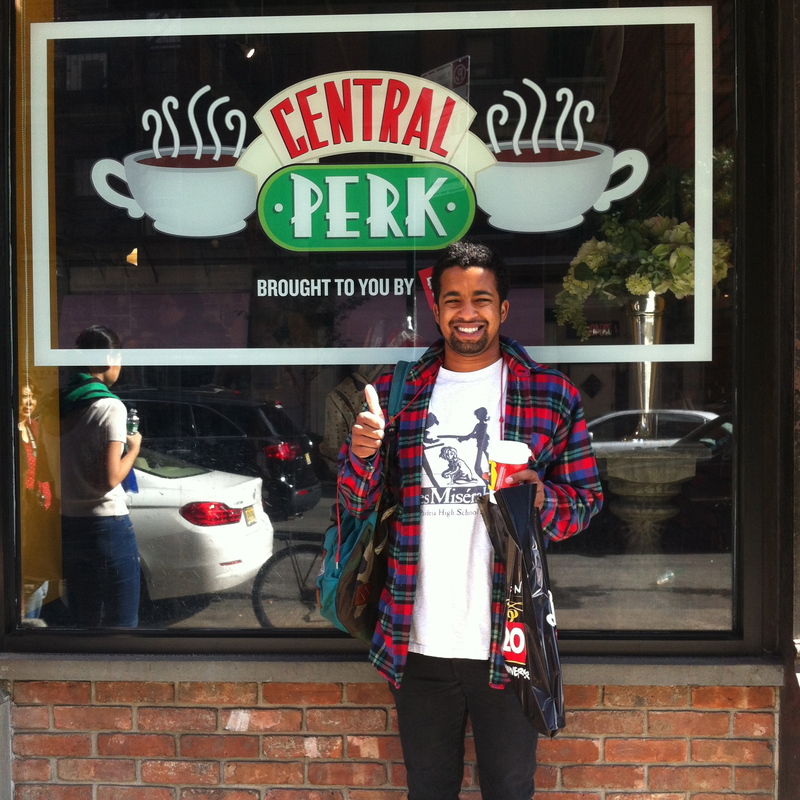 One time at Central Perk is probably enough.